The magic of make-ahead dinners is that when time is of the essence, they feel like lifesavers. They are lifesavers. Whether you’re prepping for a month-long, all-consuming work project or helping stock a friend’s freezer for when her imminent triplets (!!!) 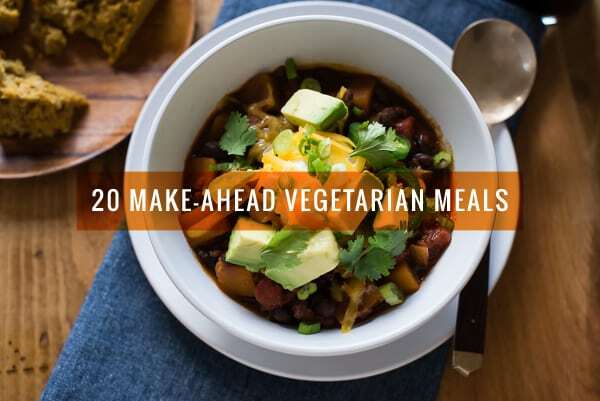 arrive, these 20 Make-Ahead Vegetarian Meals help fill the dinner table in no time at all. Description: Zucchini and mushrooms bulk up traditional baked ziti for a freezer-friendly, satiating dinner. Pure comfort, right here. huge thanks from a student with exams coming up! This is a great idea – make in a big batch then freeze and cook when I want something warming and homecooked! Such a wonderful collection!! Thanks a bunch! barnivore.com has a full list of vegan beers! Awesome post. Such amazing recipes! Interesting collection of recipes. I found several I’d be interested in making, but I’m not sure my husband would like them. Poor guy, I’m always experimenting on him, and he generally takes it pretty well. The Honey-Lime Quinoa Stuffed Sweet Potatoes has been in my regular rotation for quite a while, and I love it. I actually do it as a casserole instead of stuffing the sweet potatoes. Definitely, recommend that recipe to everyone. Hi I am unable to see any recipes. I can’t see them either. Stupid article. Did you find them?